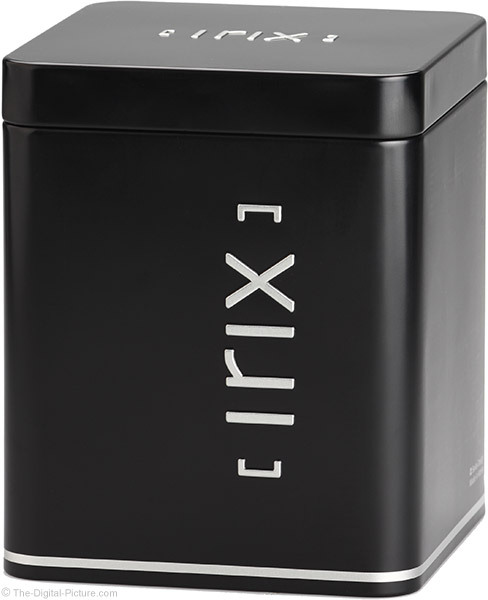 Relatively new to the DSLR lens marketplace is Irix. When Irix introduced their first lenses, the 15mm f/2.4 Blackstone and Firefly, I was intrigued. That this manufacturer gave the lenses each an interesting name helped, but the appearance of these lenses was a quite captivating. When Irix USA offered to send me a sample, I of course couldn't help myself and said "Yes!" While the Blackstone and Firefly versions of this lens are very similar (I'll compare them later in the review), it was the Blackstone version I received. There is something special about the feel of an all-metal exterior-constructed lens and this in part makes the Blackstone as fun to use as it is to look at. With a very competitive price, the Irix 15mm lenses are worth exploring and that is what comes next. Before reading any further, you need to know that this lens is manual focus only. If AF is on your requirements list, this lens will not satisfy you. If you think a manual focus only lens might work for your applications (it does work for many wide angle needs), this lens is worth considering. As always, you should pay close attention to the focal length (or focal length range) when selecting a lens, either to purchase, to rent or to simply select from your kit as different focal lengths have different applications (with some overlap of course). The 15mm focal length is ultra-wide on a full frame body, taking in a 110° diagonal angle of view. 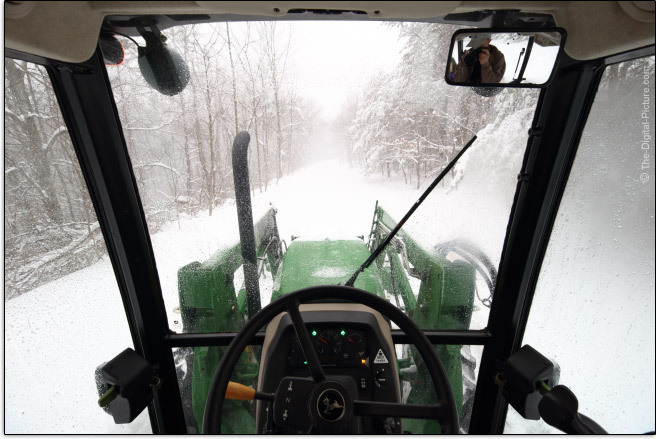 Arriving along with the Irix 15 was a significant March snowstorm, dumping 19" of snow in less than a day. So, I'll take you somewhere I don't recall taking you before – into the tractor cab. I spent some quality time in here and thought I'd illustrate the ability of the 15mm focal length to capture images in tight spaces, such as building and vehicle interiors. That might be my second selfie. Note that it is best to keep a distance from people when using 15mm for perspective issues. Get too close and noses appear very large compared to the rest of the body. Also, get one person closer than another and they no longer maintain their normal size ratio with the more-distant person appearing to shrink. 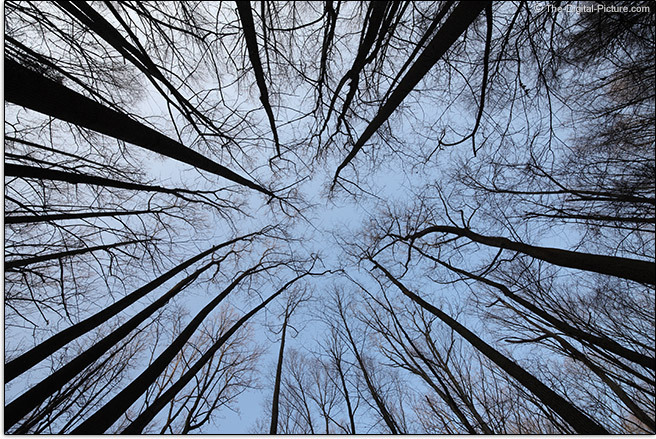 Landscape photography is perhaps the most-used application for this and similar focal lengths. With the snow removal project completed and the wind blowing strongly for a while, snow drifting was happening and I knew where I might find some snow effects to capture. 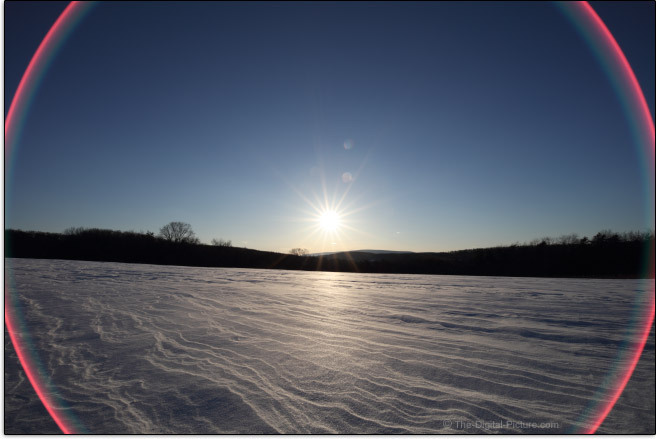 A 1 mile (1.6km) jog/hike in knee-deep snow brought me to a mountaintop field just prior to sunset. 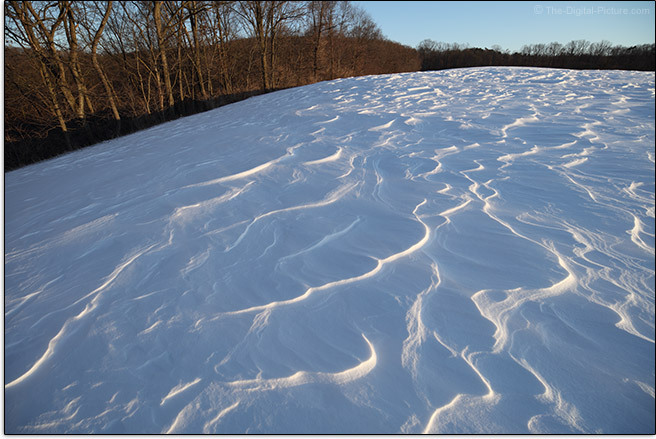 The low sun angle meant the wind-created waves in the snow were side-lit, emphasizing their shape. 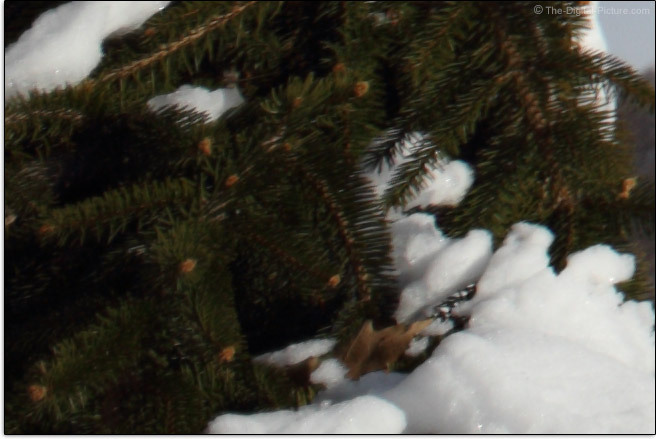 The 15mm focal length worked great for this application, emphasizing the uneven snow. I took a somewhat different route back to home and unwittingly stepped into a deep snowdrift. After sinking in well over my waist, the angle of the ground caused me to continue sliding at an angle, leaving me strongly tipped. Any attempt to move caused me to sink deeper and trying to dig out was ... an unusual experience. The camera and lens were in a Lowepro Toploader Pro 70 AW case, so no worries there and after I brushed off, only the humor of the moment was remaining. Some of the best ultra-wide angle compositions take advantage of perspective by placing an attractive foreground subject (such as a clump of flowers) close to the lens with an expansive, in-focus background showing behind it. The snowy field sample picture illustrates this concept, with the snow waves appearing large in relation to the trees in the background. Keeping everything in an expansive scene in focus is also an attribute this focal length has. There is going to be a lot of background in most 15mm images and, details in that background are going to be rendered small, usually recognizable and likely completely in-focus. Even when focused at the minimum focus distance with a wide open aperture in use, background details often remain recognizable. With that concept in mind, consider the landscape locations suitable for these angles of view. They abound and although it is not hard to compose good ultra-wide landscape images, it is somewhat challenging to create great ones. Notice how straight the buildings are in this example? Shooting level to the horizon is key to this result as converging lines come into play when shooting upward or downward. Envision the same crop removed from the following sample picture. The buildings appear to be leaning strongly outward. If the camera would have been angled downward even more, the buildings would appear to have an even stronger lean. If the camera were angled upward with the skyline low in the frame, the buildings would appear to be leaning inward. If this effect is not desired in your images, shoot with a level camera and crop any unwanted foreground and/or background from your images. Architecture and real estate photography can make use of the 15mm focal length. This is also a useful focal length to have in a photojournalism kit. To see how 15mm fits into the neighboring focal lengths, I'll sandwich an Irix 15 sample picture within a comparison example captured with the Canon EF 11-24mm f/4L USM Lens. 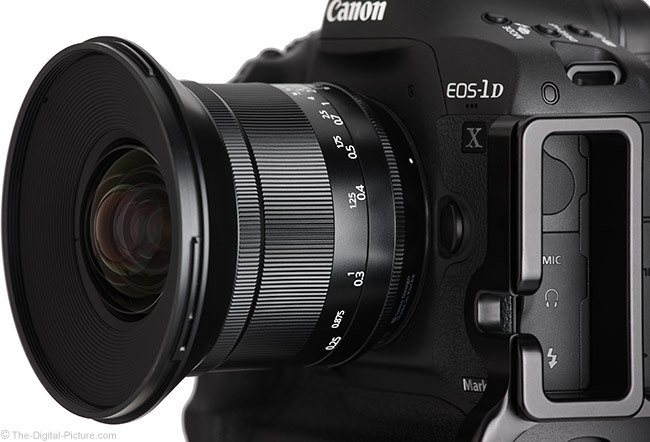 A 15mm lens on an APS-C/1.6x format DSLR delivers an angle of view similar to a 24mm lens on a full frame body. And a full frame 24mm AOV is an even more-commonly used focal length/AOV for landscape photography and other more-general-purpose uses. Composing great 24mm images is easier than composing great 15mm images. It is unlikely that you have seen many lenses advertised as having an f/2.4 max aperture. Canon cameras do not even report this aperture, showing only full 1/3 aperture stops with this lens being indicated as an f/2.5 lens (note: we state f/2.4 on the test results to avoid confusion). While that tiny difference will be considered irrelevant by most, either of these apertures gives this lens, at least for a short period of time, the widest available max aperture in a full frame lens wider than 20mm. There are many f/2.8 options falling within a mm of 15mm, so the lead is perhaps not as dramatic as it sounds. The Sigma 14mm f/1.8 DG HSM Art Lens has been announced and will soon take this crown, but ... that doesn't affect the Irix lenses wide aperture feature. Allowing more light to reach the sensor permits freezing action, handholding the camera in lower light levels and/or use of a lower (less noisy) ISO setting. 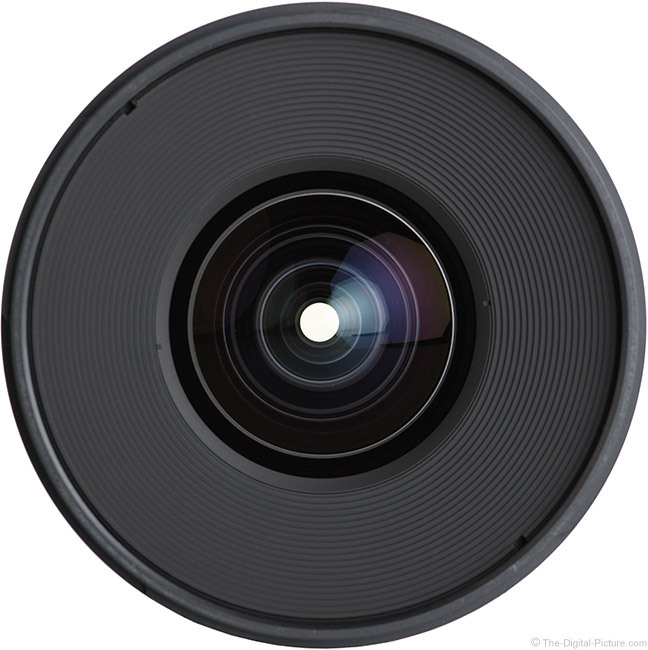 Disadvantages of a wide aperture lens, especially due to the larger lens elements required for such, include larger size, heavier weight and higher cost. Of all of the image quality aspects a lens has, sharpness, the appearance created by contrast and resolution, is usually the one most desired to be great and it is usually the sharpness results that I am most anxious to see when evaluating a lens. 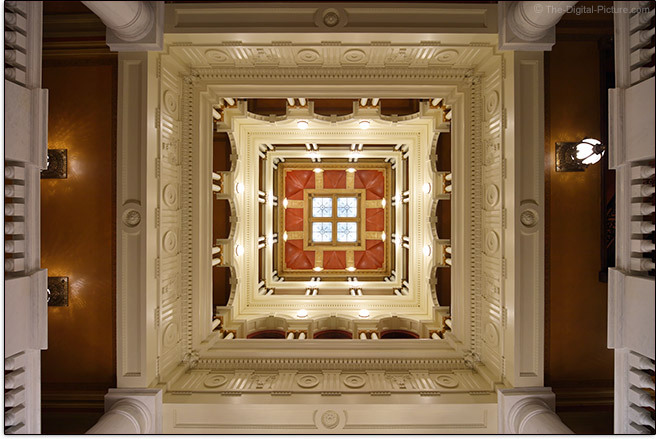 This attribute sometimes changes significantly throughout the image circle and throughout the aperture range and that is the case with the Irix 15mm f/2.4 Blackstone Lens. In the center of the frame at f/2.4, this lens is reasonably sharp and with a nice improvement showing by f/4, it is razor sharp. No further center of the frame discussion is warranted, but I'll share some 100% resolution crops taken from the center of Canon EOS 5Ds R frames. These images were captured in RAW format and processed in DPP using the Standard Picture Style with sharpness set to "1" (very low). Note that the third set of examples were captured under low contrast, shaded daylight conditions indoors. Out in the periphery of the image circle, it is normal for sharpness to be reduced and that is the case for this lens. How much reduction is the big question. Complicating matters is that not all corners of this lens show the same performance. This lens' strongest corner, the upper right, is shown in the site's image quality tool. The bottom-left is the worst with the other two falling in between. 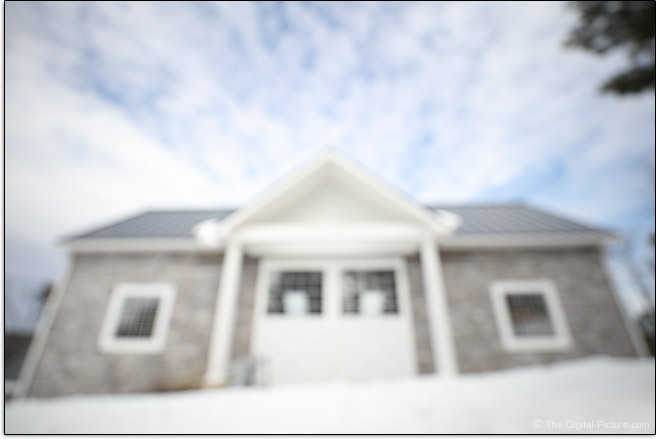 At f/2.4, most are going to consider the midframe area midly soft and the corners quite soft. As usual, stopping down improves corner performance and while some improvement is seen at f/4, a very noticeable improvement is seen at f/5.6 where extreme corners are quite nice, though they still show some aberrations with astigmatism being especially noticeable at the bottom corners. The resolution chart makes this readily apparent and I think that you will like the real world performance a bit better than the chart shows. The following examples are 100% crops taken from corners of 5Ds R images processed identically to the above comparison examples. The first set is from the extreme bottom-left corner and the second set is from the extreme top-left corner. I know, the f/2.4 samples are dark (I brightened the second set of examples by 1 stop). We'll get to the reason why next, but ... the details are recognizable. At f/5.6, the results show very nice performance for absolute corners from an ultra-high resolution DSLR. With roughly 4.5 stops of vignetting in full frame corners at f/2.4, you are going to recognize the peripheral shading. While this amount is very strong, it is not unusual for a fast 15mm lens. 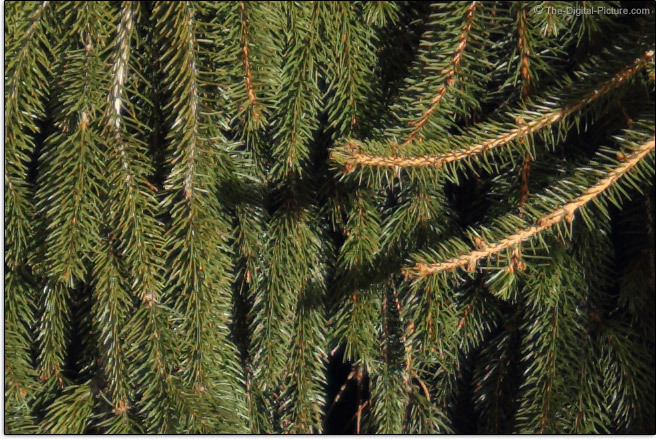 By f/2.8, the corners brighten by roughly 1/2 stop and by f/4, they are brightened to about 2.5 stops of shading. That amount is still easily recognizable and though corner shading continues to improve through f/16, there remains a still-sometimes-noticeable 1.2 or more stops of shading. Using an APS-C format camera? You can expect to see a sometimes-noticeable 1.5 stops of shading in the corners at f/2.4. By f/4, the shading is down to a very-seldom-noticed about 1/2 stop. Now let's take a look at CA (Chromatic Aberration). I find lateral (or transverse) CA to be the easiest type of CA to recognize. LatCA shows as different colors of the spectrum being magnified differently with the mid and especially the periphery of the image circle showing color fringing along lines of strong contrast running tangential (meridional, right angles to radii) as this is where the greatest difference in the magnification of wavelengths exists. 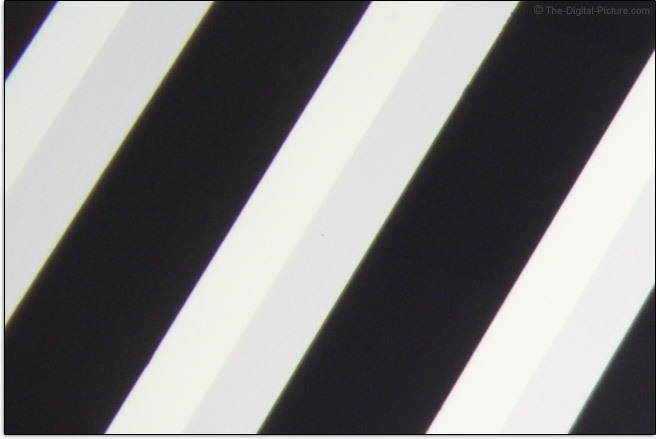 The image below shows a worst-case scenario with white-on-black lines running across a full frame EOS 5Ds R corner. This lens has only a small amount of LatCA and fortunate is that LatCA is easily software corrected by radially shifting the colors to coincide. The follow examples show the same scene with background and foreground being blurred. If the just-described aberrations were strong, we would see differing specular highlight fringing colors coming from the neutrally-colored silver bracelet. While the foreground and background blur colors are not completely identical, they are not far from being so and indicate that this lens is performing well in this regard. While increased lens element count increases the odds of a lens showing flare effects, this lens' 15 elements in 11 groups design is not at either end of the spectrum. Irix advertises (right on the lens) a neutrino coating designed to decrease the effects of flare, but still, this lens shows a relatively strong amount of flaring at f/2.4 and the amount increases slowly through f/16. The above f/16 image was converted in DPP using the standard picture style. It was otherwise unenhanced, including no additional saturation dialed in. Position the sun more off-center and the brilliant circle disappears. In general, as you move farther away from the center of the image circle, the greater the lens aberrations tend to be and frame corners are where coma shows most readily. Coma is generally recognized by sharp contrast towards the center of an image and long, soft contrast transition toward the image periphery. Coma is most visible in wide aperture corners and significantly resolves when the lens is stopped down. The pin-point stars in the night sky are the subject that makes this aberration, along with some others (including astigmatism), most easily recognizable to me. 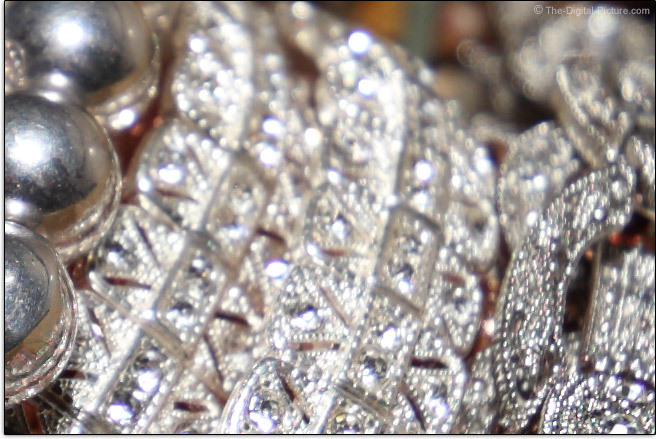 Here is an example taken from a near-extreme 5Ds R top-left corner. No, we were not being invaded by flying saucers that night. 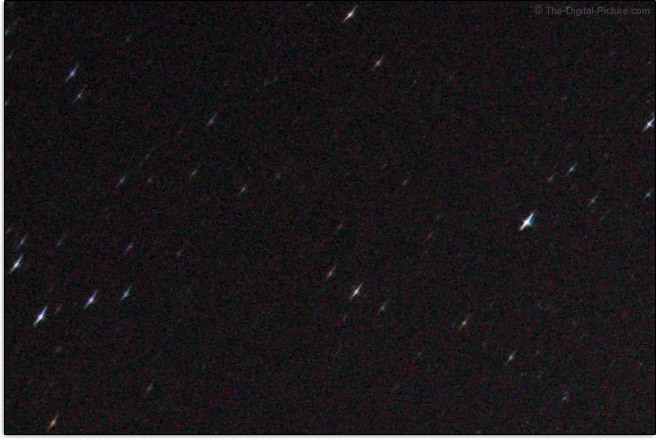 Those are stars and this lens shows a relatively strong amount of corner aberrations. From a linear distortion standpoint, this lens has slight-to-moderate barrel distortion. Here is a near-full-width, bottom-of-the-frame crop with the straight line across the bottom of the windows showing some curvature. If you are shooting architecture, this distortion may bother you. If you are photographing landscape, you will likely only notice this curving when a completely flat horizon (such as an ocean) is positioned along a frame border. Distortion can be corrected in software, though this correction is destructive at the pixel level. While one should not expect a 15mm lens to produce extremely blurred backgrounds, when focused at or near the minimum focus distance with an f/2.4 aperture and a distant background, this lens can produce some separation of the subject from the background and the quality of the blur is decent. Following are two examples of the background blur produced by this lens when stopped down to f/5.6 (where the diaphram blades are involved). The first example is a 100% crop and the second is a slightly reduced example. In the first example, captured at f/5.6, we see the 9-blade curved aperture creating some moderately-rounded specular highlights with fuzzy peripheries and not-the-smoothest centers. In the second example, a distant piano turns into a rather nice blur that is typical for what I'm seeing from this lens. Due to the 9 aperture blades, this lens delivers 18-point stars from point light sources when used at narrow apertures. An example of this effect can be seen in the circular flare effect sample shared above. Looking at the image quality this lens produces overall, I think that most will be very happy with the center of the frame results, especially if stopped down to f/4. Those wanting sharp full frame corners will likely not be as happy until this lens is stopped down to at least f/5.6. Fortunately, applications where sharp corners are needed typically also need a lot of depth of field and this lens' f/5.6 and narrower results are ideal for landscape and architectural photography. Astrophotography applications are one exception and the soft corners at the most-needed night sky aperture, f/2.4, are not stellar for this purpose. Image quality is highly dependent on accurate focusing and, with all manual focus lenses, including the Irix Blackstone, that accuracy is up to you. The good news is that this lens provides a high quality MF system. The very smooth focusing ring has a huge 152° of rotation with very precise manual focusing available at all focus distances. This moderately sized ring is flush with the lens barrel, yet easy to find. Like the rest of the exterior of this lens, the focus ring is all metal including the ribs. Infinity and minimum focus distances are hard stops which means that focus distance settings/marks are easily repeatable, an attribute highly valued by videographers. A unique feature to this lens is a light click stop at the infinity mark. Most lenses focus past their actual infinity setting to account for needs in extreme temperatures, but the click stop makes normal-infinity easy to find without looking at the lens. Also unique to this lens is the focus scale calibration adjustment. "The focus calibration hole can be found under a detachable cover and provides access to the rings regulating the focus scale position." [Irix] As delivered, I found this lens to focus on stars at the full infinity extent. 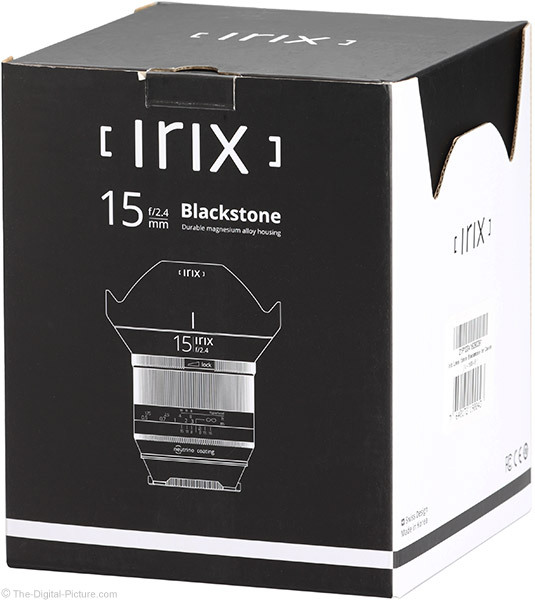 The Irix Blackstone 15 provides a full DOF (Depth of Field) scale including engraved aperture marks covering f/8 through f/16. Alternatively, use the provided hyperfocal setting marks. One more feature unique to a wide angle lens is the focus lock ring. Set the focus distance and adjust the friction ring to the locked position to ensure that the selected focus distance remains unchanged. An example of this ring providing value is when a landscape photographer using a narrow aperture and a focus distance setting that keeps infinity in focus with as much depth of field as possible locks in this focus distance setting. The lens can then be quickly used for all scenarios requiring this focus distance setting without attention to focus required. While this ring is raised slightly above the focus ring, it is narrow and firm to turn, so care must be taken to avoid changing the focus distance setting when locking it down. Videographers pulling focus, photographers intending to use focus stacking techniques involving focus distance adjustment, and anyone very-critically framing a scene will greatly appreciate the lack of subject size change occurring during even full extent focus adjustments with this lens. 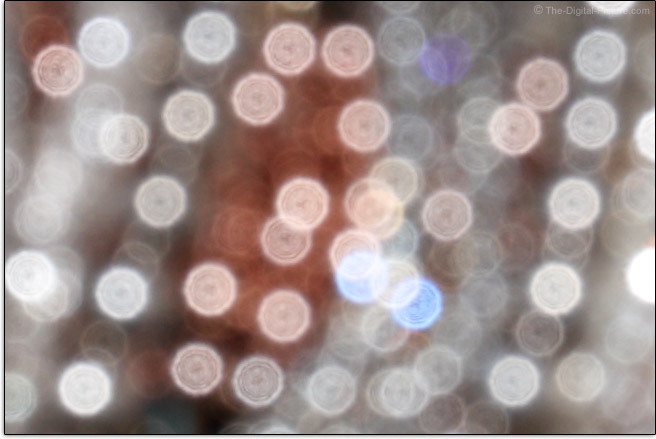 As mentioned, focus accuracy is 100% your responsibility with a manual focus-only lens. In the old days, manual focusing was all we had. However, in those days, we were given bright viewfinders with split image rangefinders and microprisms. The viewfinder's in-focus indicator light will come on when the camera thinks that accurate focus has been acquired, but this is an imprecise indication. Ideal is to use live view (on the back of the camera or in an electronic viewfinder) under maximum magnification where very precise manual focusing can be very reliably established. The downside of course is that not all situations permit use of the magnified live view method. Though depth of field is related in part to the reproduction ratio being used at the time (with distance to the subject and focal length being factors), I often use wide angle lenses such as this one to take in the bigger picture and in those cases, I have a greater manual focus success rate using the stock focusing screen. With an 11.0" (280mm) MFD (Minimum Focus Distance) spec from a 15mm wide angle lens, prepare to be unimpressed with the MM (Maximum Magnification) spec. The lens has a 1:9 reproduction ratio, equating to a 0.11x MM. Helping the Irix was that we measured the MFD to 9.1" (230mm), slightly closer than its spec. Mounting an extension tube behind a lens is often a good way to reduce the MFD and thereby increase the MM. However, ETs are generally not very useful on lenses with focal lengths this wide. In this case, a 12mm ET reduces the focus distance so much that the maximum infinity focus is right in front of the glass and the combination is basically useless. It is possible that the shorter Vello 7mm Manual Extension Tube could work, but ... that combination would need to be tested and I'm unsure what the resulting image quality would be like. When the Irix 15mm f/2.4 Blackstone Lens was announced, the product images were what first caught my eye. This lens features a bold, attractive graphic design along with an alluring shape. Fortunately, the build quality of this lens seems to match its good looks. 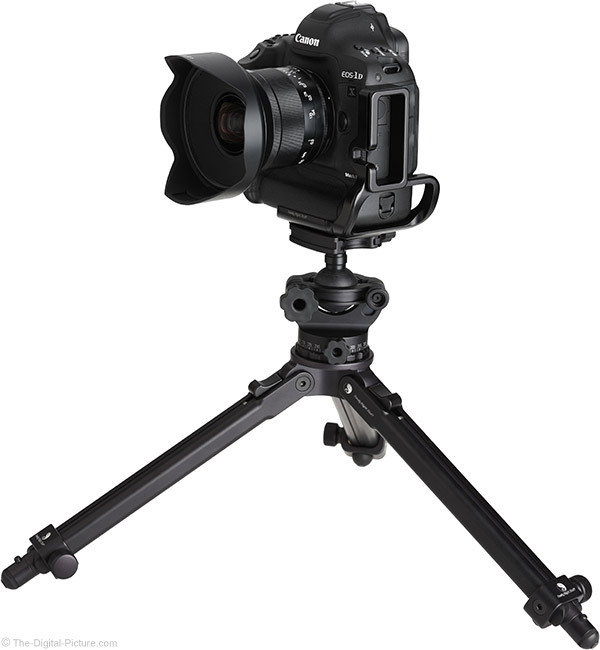 The Irix Blackstone 15 has an all aluminum-magnesium housing construction, including the focus ring and its ribs. The barrel is relatively straight in diameter with a raised-rib grip at the mount and the slightly-raise lock ring. The objective end of the lens flares rapidly outward from the lock ring. 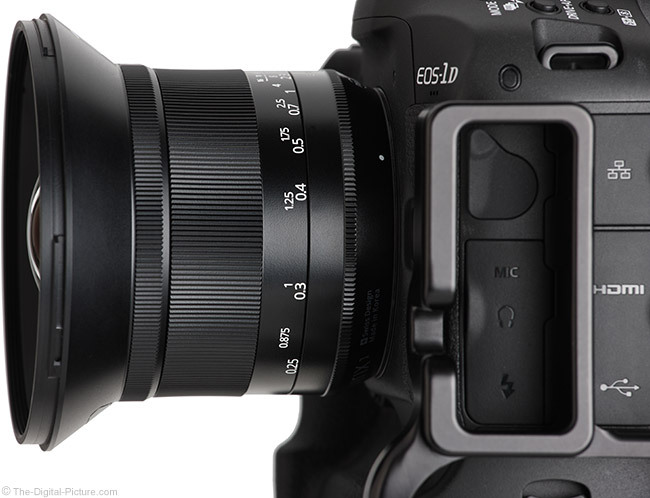 Overall, the lens is quite comfortable in the hand with the flared end creating a sure grip. The lens is finished in a subtlety-textured, semi-gloss black paint that is described by Irix as "premium anti-scratch". As mentioned earlier in the review, the markings are etched into the lens and a UV light reactive paint is used. In addition to the durable build quality, this lens is fully weather sealed with dust and splash-resistant seals including around the front element and mount – no front filter is required for full weather sealing. 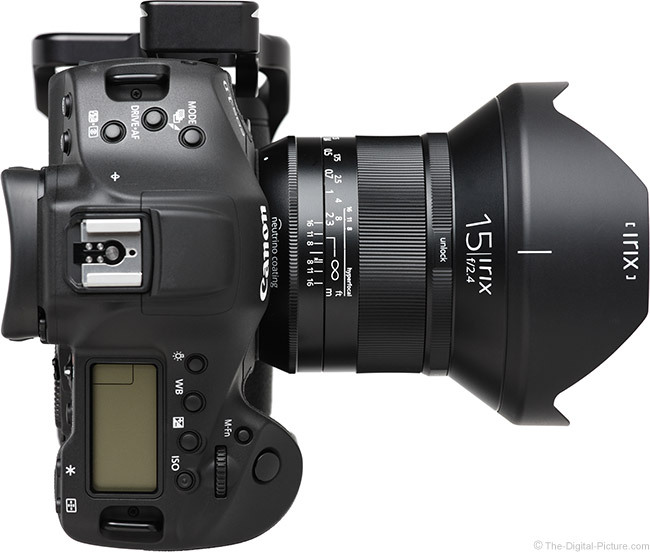 The Irix 15 has an ideal size and weight for serious long-term use. There is adequate space to grip the lens but the lens is not so large that it gets in the way. The weight is similarly comfortable. For many more comparisons, review the complete Irix 15mm f/2.4 Blackstone Lens Specifications using the site's Lens Spec tool. The same lenses are shown below, all with their hoods in place. Use the site's product image comparison tool to visually compare the Irix 15mm f/2.4 Blackstone Lens to other lenses. I preloaded that link with a pair of zoom lenses beside the Irix. 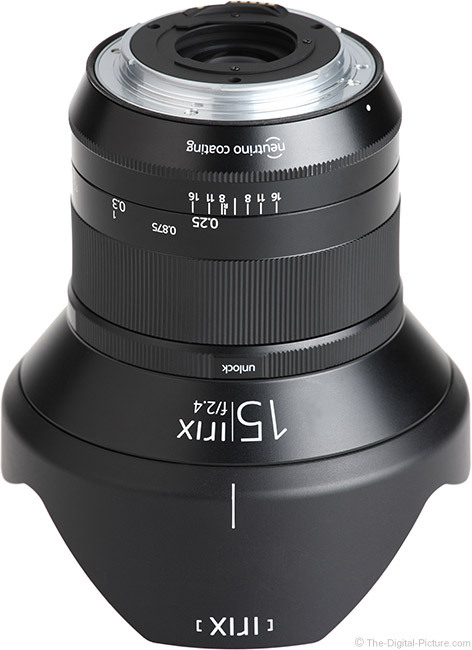 The Irix Blackstone 15mm f/2.4 Lens features 95mm front filter threads. That a lens this wide and fast accepts a front filter is a very positive feature, but that the 95mm filter size is not terribly common and that these are very large filters are two points that combine for a sizable 95mm filter price tag. It is interesting how small the front lens element is in relation to the overall diameter of the lens. The lens hood has a small window on the bottom, allowing a circular polarizer filter to be rotated through it. While a nice idea, a 95mm filter is large and when adjusting a circular polarizer, I most frequently need a 90° rotation adjustment, such as when changing camera orientation. With such a small opening, it takes a LOT of turns to move the filter a significant amount. I was barely able to turn my Heliopan CPL at all through the window and ended up with a very stuck filter from the effort. I'm not sure why the filter got stuck, but I was thankful to have a filter wrench readily available. Small tweaks to the filter setting can be made through the window, but ... you will likely find it quicker to remove the hood for normal use. I epoxied the similar window closed on my Canon EF 100-400mm f/4-5.6L IS II Lens hood as it seemed to always be forced opened when being removed from a case. This lens hood window design has not exhibited the same problem for me, but ... at this point, I find it no more useful. 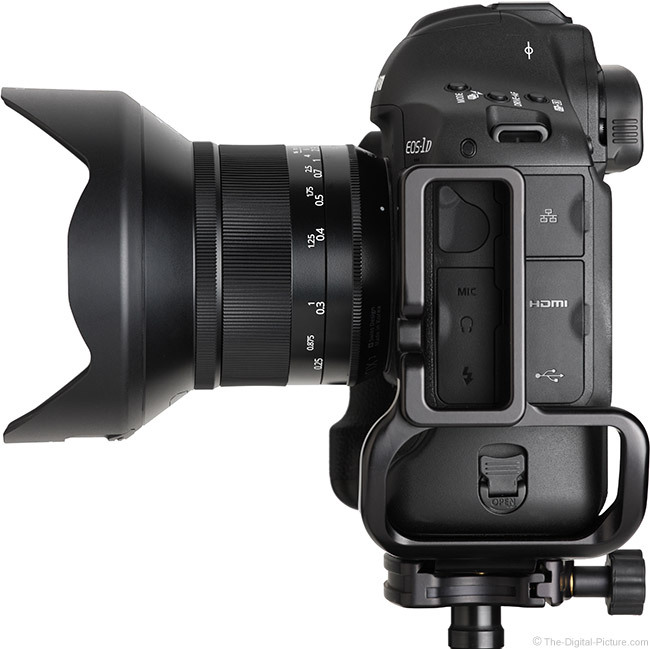 On lenses this wide and fast, the lens hood is often permanently attached. As just hinted to, that is not the case with this lens. The rigid plastic hood is removable and the interior has a slightly-rubberized matte finish. Note that the petal-shaped hood can be installed mis-aligned, creating strong mechanical vignetting. Remembering that the large logo petal goes on top and the filter window goes on the bottom should keep you out of trouble. A gel filter slot is provided on the mount end of the lens, utilizing 30 x 30mm cut gel filters. 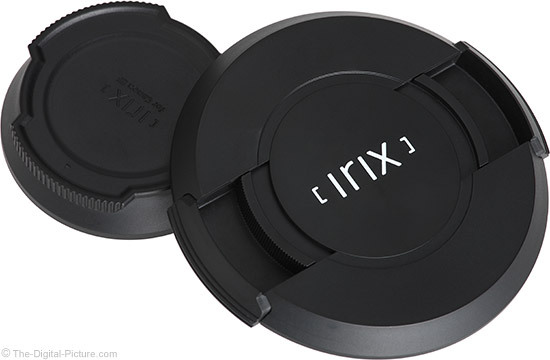 The Irix front lens cap is beveled inward on the rim, making it somewhat hard to grasp from the sides, but the center-pinch access is more sure. The rear cap is a shallow, easy-to-grasp design. 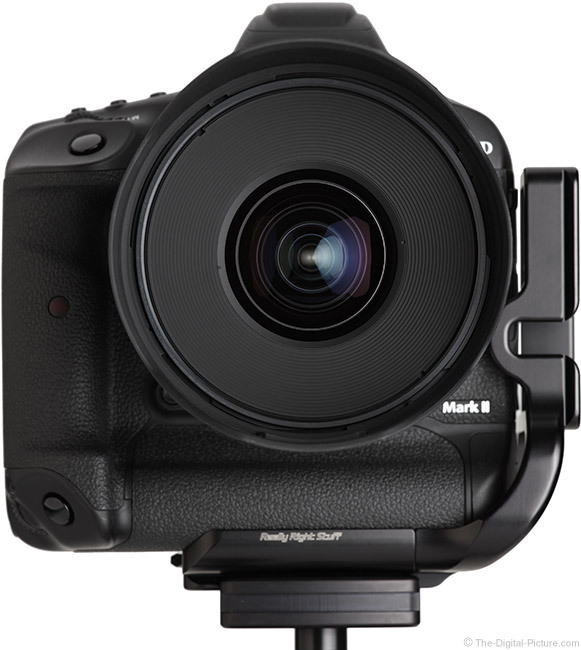 The flared edges also maintain the lens' stability when sitting on the rear cap. The Blackstone 15mm lens comes in a stylish box and in the box is ... get this ... a tin. Good things always come in tins, but ... I don't ever remember ever getting anything as good as a lens in a tin. Inside the tin is a semi-flexible, shaped, padded case featuring a unique, also-stylish design. While offering a moderate level of protection, the case does not have a belt loop or strap for carrying purposes. The Irix 15mm f/2.4 Blackstone Lens has a moderately-low price tag that seems appropriate for what you get with this lens. I'll make some supporting comparisons in the alternative lens section coming next. Swiss design, made in Korea – that is what it says on the lens. 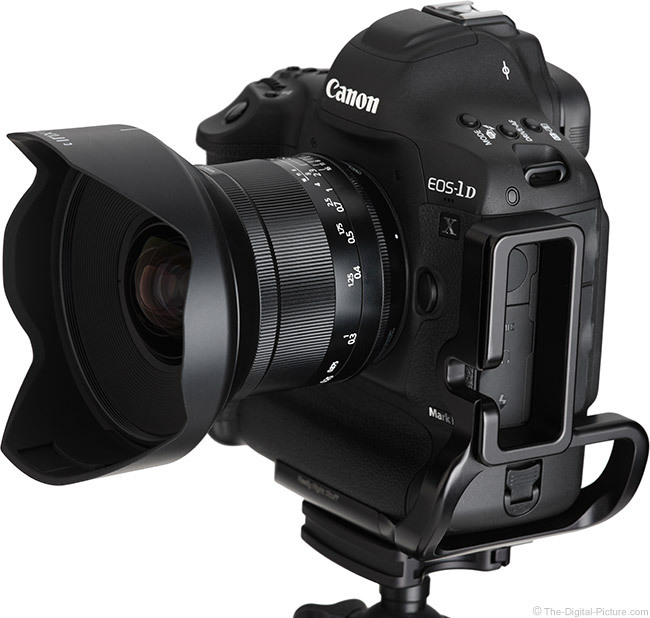 This lens is available in Canon (reviewed), Nikon and Pentax mounts. My standard disclaimer: There are potential issues with third party lenses. Since Irix reverse engineers (vs. licenses) manufacturer electronics and algorithms, there is always the possibility that a DSLR body might not support a (likely older) third party lens. Usually a lens can be made compatible by the manufacturer via a firmware update, but this cannot be guaranteed. There is also the risk of a problem that results in the lens and body manufacturers directing blame at each other. Since this lens is manual focus-only, the risk of compatibility issues are decreased and Irix USA's 5-year warranty is superior to most. Irix is a relatively new lens company and I inquired about service of this lens. Irix USA informed me that they plan to open a repair facility in the USA this year (2017) and until then, any lens with a problem is simply being replaced. 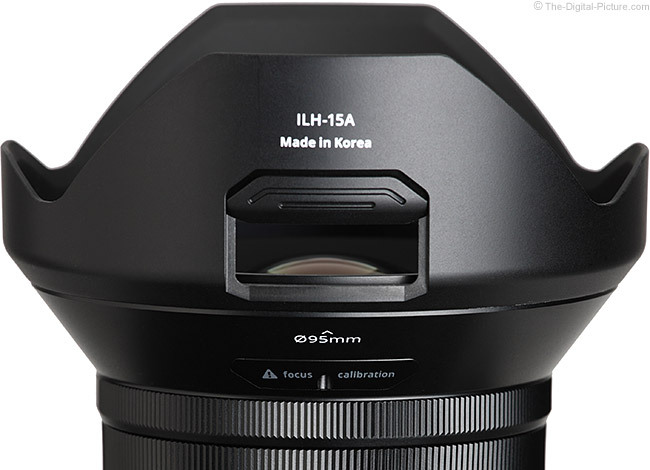 The first lens the Blackstone 15 should be compared to is its sibling, the Irix Firefly 15mm f/2.4 Lens. 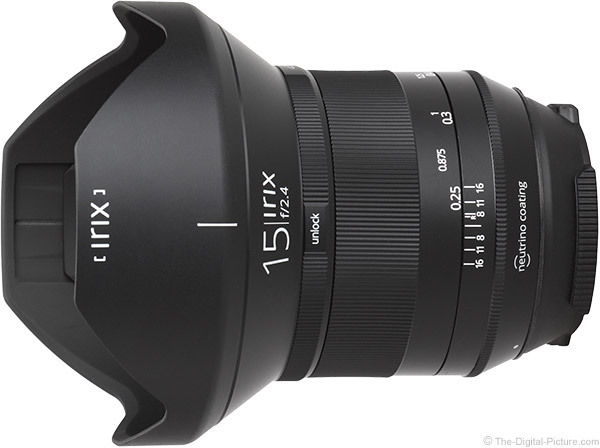 That's right, Irix offers two versions of their 15mm f/2.4 lens. "Our Firefly lens offers the same optical performance and high quality mechanism as our Blackstone, but its ultra lightweight construction makes it the perfect choice for hikers, travelers, or anyone who simply likes to pack light." [Irix] The Firefly forgoes the aluminum-magnesium alloy housing material, the premium anti-scratch finish, the engraved markings with UV light reactive paint, the full weather sealing and the rigid case is traded for a soft case. In addition to a 12% weight savings, the Firefly has a 33% price savings over the Blackstone and that difference is probably going to feel even more significant to most. 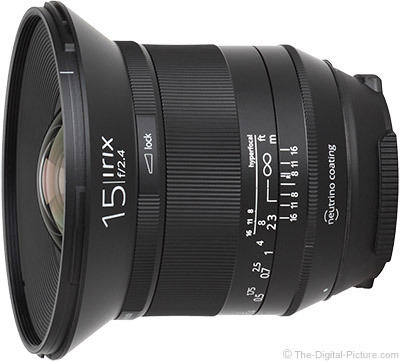 Competing strongly with the Irix lenses is the Samyang/Rokinon 14mm f/2.8 IF ED UMC Lens. At f/2.8, the Irix is slightly sharper in the center and the Samyang is sharper in the periphery. By f/5.6, the two lenses are performing quite similarly with the Irix taking a slight edge in the corners. At f/2.8, the Irix has about 1 stop less vignetting than the Samyang. By f/5.6, the difference is gone and by f/11, the Samyang has about .4 stops less vignetting. The Irix has considerably less distortion, has 3 additional aperture blades (9 vs. 6), has a removeable lens hood, can utilize front filters and has a nicer overall design. The Samyang is 1mm wider in focal length, is slightly smaller/lighter and is priced slightly higher or lower than the Firefly (depending on the Samyang/Rokinon branding), with either scenario making it considerably less expensive than the Blackstone. Which lens to compare next is the question due to the big price increase accompanying the rest. I'll start with the Zeiss 15mm f/2.8 Milvus and Classic Lenses. I expected the Zeiss lenses to perform on a totally different level than the Irix lens, but ... the difference is not as substantial as my expectation. While the two Zeiss lenses share the same optical design, the first Milvus 15 we've had in the lab is delivering poor mid and peripheral image quality (it has an alignment problem). While we work out that issue, I'll switch to the Irix vs. Zeiss Classic 15mm lens comparison where we see the Zeiss lens performing modestly better in the center of the frame and notably better in the corners. The Irix catches the Zeiss in the center at f/4 the corner differences at f/5.6 and f/8 are not strong. The Zeiss has more LatCA in the corners (correctable) and about 1/2 stop more peripheral shading at f/2.8. By f/5.6, the difference in shading is irrelevant and at f/11, the Zeiss has .4 stops more shading in the corners. While the differences in build quality do not appear as significant as the price differences, the Zeiss lenses are built like few others – and they weigh more. The Zeiss Classic has a built-in hood while the Milvus and Irix hoods are removeable (the Zeiss hoods are metal). The Zeiss lenses cost significantly more. 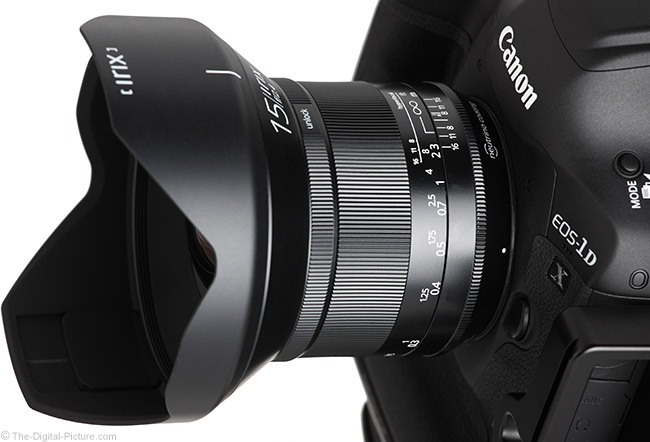 The 1mm shorter Canon EF 14mm f/2.8L II USM Lens is another comparable lens with a much higher price tag. However, the Canon brings with it a much-loved feature not found on the Irix, autofocus. In the Irix 15mm f/2.4 vs. Canon EF 14mm Lens comparison, the major difference I see is the amount of lateral CA. The Irix has little and the Canon has a significant amount. Correct for the CA and ... it would be much easier to determine the sharpness differences. The Canon has less vignetting at f/4 through f/5.6. The Irix has 9 aperture blades vs. the Canon's 6, a 152° focus ring rotation vs. the Canon's 105°, a removable hood vs. the Canon's built-in hood and filter threads vs. none. The Canon lens is narrower. With the same focal length available and nearly the same max aperture available, the Tamron 15-30mm f/2.8 Di VC USD Zoom Lens warrants comparison. The Tamron is roughly 2x more expensive than the Irix, but offers benefits including autofocus, a range of focal lengths and Vibration Control. The Irix 15mm f/2.4 vs. Tamron 15-30 f/2.8 VC Lens comparison shows the Irix noticeably outperforming the Tamron in the mid and periphery at f/2.8. By f/5.6, the Tamron has made up a lot of ground and by f/8, the sharpness differences are minor. 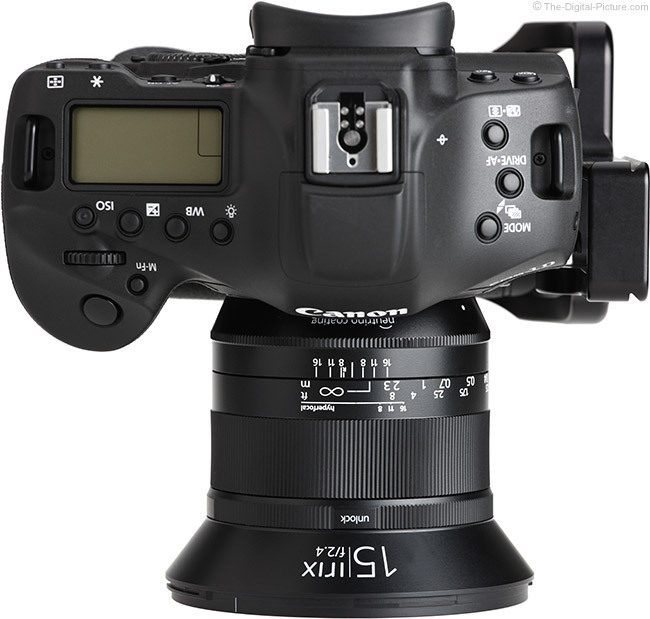 The Tamron has over 1 stop less vignetting at f/2.8 through f/4, and still retains a small advantage through f/11. The Tamron has significantly more barrel distortion at 15mm, is significantly larger, weighs significantly more and has a significantly higher maximum magnification. The Tamron is not able to use front filters. While it is only 16mm at its widest angle, the Canon EF 16-35mm f/2.8L III USM Lens is an incredible lens worth considering if looking for a fast wide angle lens. The Canon is far more expensive than the Irix, but its advantages include autofocus and a zoom range. 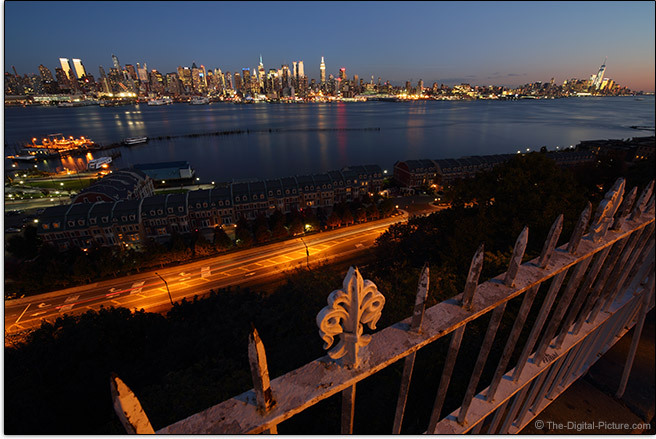 In the image quality comparison at f/2.8, the Canon 16-35mm f/2.8L III proves noticeably sharper than the Irix 15. The Irix catches up in the center at f/4, but the Canon holds the corner advantage even at f/8. The Canon has nearly 1 stop more vignetting at f/2.8, but at f/5.6, the two lenses are near equals in this regard. The Canon has significantly more barrel distortion and shows significantly less flare. The Canon has a much higher (0.25x) maximum magnification and uses smaller filters (82mm vs. 95mm). Currently an unknown is the Sigma 14mm f/1.8 DG HSM Art Lens. This announced, but not yet available lens is going to be the fastest full frame lens option wider than 20mm. It will have autofocus and likely a much higher price tag. Use the image quality comparison tools on the site to create your own comparisons. While reviewing this lens, I was not being overwhelmingly convinced of its value proposition. But, when I started putting the Irix 15mm f/2.4 Blackstone Lens up against the comparables, I began to see it in a different light. 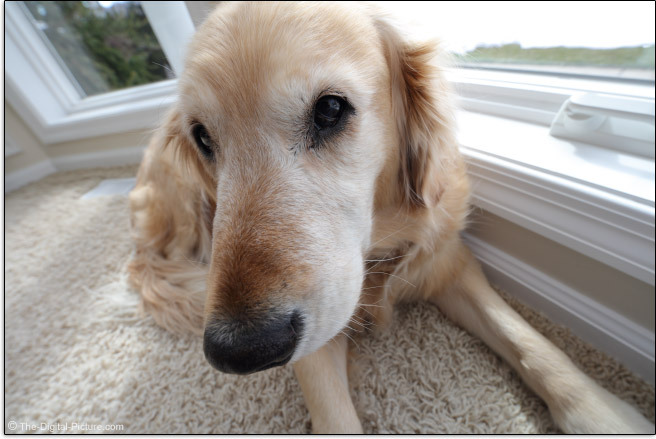 It is not a perfect lens, and I would especially like to see the wide open corner image quality improved. But for the price, its value is easy to recognize. Getting a weather-sealed aluminum-magnesium lens barrel with decent image quality for a relatively low price puts this lens squarely on the consideration list. And for a new lens manufacturer, that is an impressive feat.